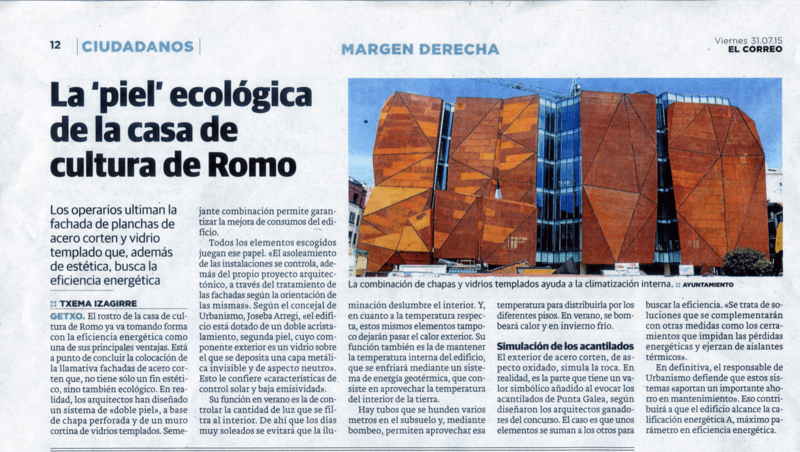 The new House of Culture of Romo (Getxo) is designed with a "double skin" of IMAR of cut perforated corten steel plate that protects the excessive heat and light to the interior and gives the building a great energy efficiency Its exterior appearance rusty, recreates the rocks of the cliffs of Punta Galea; but this facade is not only an aesthetic but also ecological function. The design "double skin" allows it to be "transparent" from the inside through the perforated plate, but pass prevents excessive heat and light from outside to inside. The building also has a system that uses the temperature of the earth to distribute cool in summer and warm in winter. All these systems together give the building an energy efficient.